Make that 917 examples to hit the road. There is nothing more heart-wrenching than seeing a phenomenal hypercar get crushed in an accident or consumed by a fire. 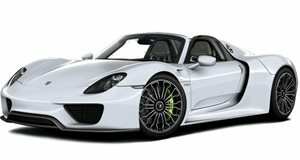 With only 918 examples of the Porsche 918 Spyder planned to be built by the German automaker, the world has just lost one of its newest units. The 887 horsepower hybrid hypercar caught fire in a gas station, but there's no news about what caused it. What is clear, is that this 918 won't be returning to service anytime soon. Luckily, it seems that nobody was hurt by this incident.